Advertising and marketing is the way to showcase your products in front of the visitors and customers. Through advertisements and marketing, the selling brands and products get more attention of the visitors and help in driving conversion rates and sales rates. For the ecommerce vendor sellers of Amazon, Amazon has come with its new Amazon marketing services or AMS. It provides the advertising and marketing solution to the sellers those are selling through vendor central to promote their brands and products. With the Amazon Marketing Services, the vendor central sellers can create ad campaigns for their products to make more discoverable and visible to their buyers within their targeted campaign budget. Who are eligible for Amazon Marketing Services? AMS are exclusively for the Amazon vendor central sellers who have their brand registered on Amazon. Third-party sellers, authors and artists are exempted from AMS access. The international brand need to sell their products on Amazon.in and their products should be legally entitled to Amazon.in market. Amazon, the giant says that these policies can be changed anytime and all the vendor central sellers as always essentially need to follow it. How Amazon vendor central Sellers can use AMS? Prior to accessing Amazon’s marketing services, Amazon vendor central sellers must have their brand registry. If you have not registered your brand on Amazon yet, then, the very first step for you to go to the Amazon’s brand registry section and register your brand. In case of any confusion, read our complete guide on Sellers enroll for Brand registry-Why and How? Once you are done with registering your brand on Amazon, you are now eligible to use AMS as your advertising solutions. Register on AMS. It allows you to create an ad campaign. Choose the products you want to promote and advertise. How Amazon processes the AMS request of Amazon vendor central sellers? As told earlier, the first process to utilise AMS is getting the brand registry done. In For this, Amazon processes brand registry request within three working days, provided you have given the complete information about your product description, brand link and brand website else it would take more time. Post this, when you register for AMS, then, on your request, Amazon drives you to the page where you can create your ad campaign and Amazon pages. AMS is a self-service where the vendor central sellers are free to design their advertisements and Amazon brand page to display the products they want to promote and popularize. Here the sellers those are selling through vendor central seller account can feed the searchable keywords with higher volume in their ad campaigns. Next, AMS asks for the campaign budget, bid for cost per click and duration for the advertised products. When vendor central sellers set the complete budget, CPC and duration, their ads get displayed on the Amazon pages. Amazon pages creation is also free. Increases visibility and discoverability of the products. Drives more product demand and customers. Boosts the conversion rates and sales rates. Sometimes the visitors just only click on the advertisements but not make the confirmed buying decision. Since AMS ad campaigns are cost per click so Amazon incurs the bid charges to the sellers without bothering that sellers have got no purchasing order. High bid price for the keywords can cost more when more customers click on these ads. 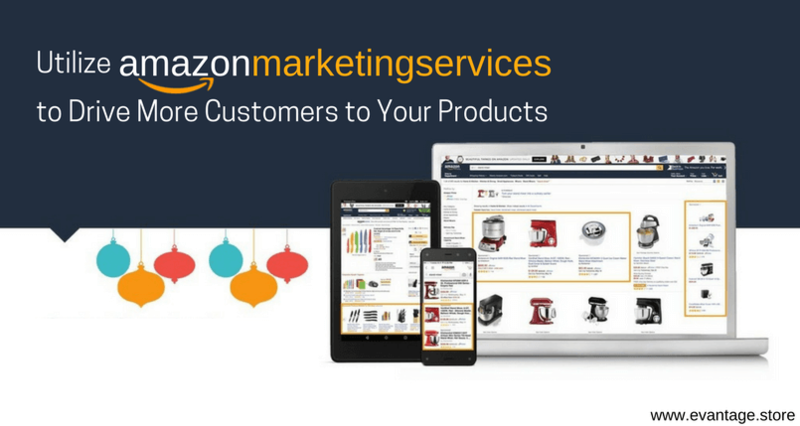 Amazon Marketing services are emerging as the advertising and branding solutions where Amazon vendor sellers are free to create their ads and campaigns depending on their campaign budget. These campaigns are controlled by the bid decided by Amazon sellers for searchable keywords. AMS advertisement contains more potential to attract the customers towards the brand and products. With the improving visibility, the chances for conversion rates also get increased. If you too own a brand and have a vendor seller account on Amazon, register for AMS immediately to make more money from Amazon platform. In case, if you find any difficulties, then, it’s better to hire the Amazon service provider who can efficiently manage your ads campaigns with the searchable keywords and within the budget also. Evantage is the leading Amazon service provider that serve its clients to manage their complete Amazon account to reap maximum profit from Amazon. Guest article written by: Arya Stones an editorial: Guest Post Writer at Evantage in Los Angeles City. I have done my MBA in Finance and Financial Management Services in 2016 from The Pepperdine Graziadio MBA. She writes for all the content including website, social media content, articles, and other marketing collaterals. I work in the Content writing department, I write blogs for the Evantage. Previous post: Android vs iOS: What Are the Main Differences Between These Two Popular Operating Systems for Tablets?